With reproduction costs accounting for a significant portion of the expenditures on a dairy, current trends demonstrate more and more producers looking into solutions to improve their reproductive programs, including the use of activity monitoring systems. “For years, there was discussion and academic studies that proved the strong correlation between a cow in heat and her movement pattern,” Cecilia Bågenvik, Business Manager for Farm Management Automation at DeLaval International, says. She explains that the DeLaval Activity System was developed to help farmers improve their breeding program and profitability by increasing the pregnancy rate of the herd, reducing reproduction costs and increasing total milk production. Although DeLaval first introduced its activity system in the mid-1990s, Bågenvik says the system was not available in the U.S. until several years later. Now this stand-alone system is currently installed on operations across the country ranging from 100 cows to 6,500 cows. Click here to read about five other activity monitoring systems featured by Progressive Dairyman . Bågenvik says that during a wide scanning of existing products using motion sensors DeLaval came across the pacemaker used by heart patients. Bågenvik explains that there were some issues and questions that the company had to address in the beginning regarding its activity monitoring system, including which type of tag to use. “Very early in the process, we chose to use neck-mounted tags to avoid injures on the cows’ legs as seen during initial testing,” she says. The system consists of several components including the system software, controller boxes, antennas and the activity tags. 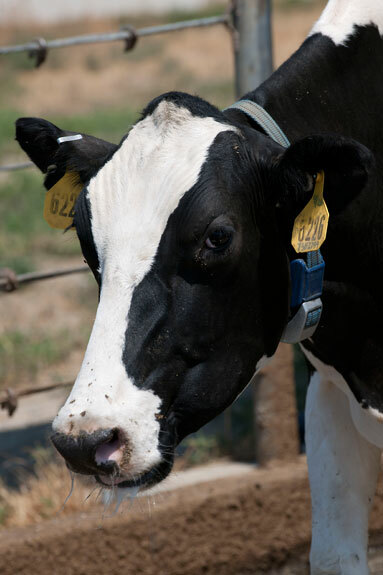 The tags are the system’s starting point, sending a cow’s activity data wirelessly to an antenna every hour. 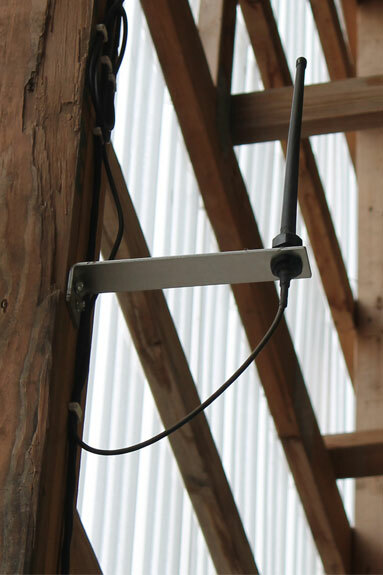 Once the antenna, which can cover a radius of up to 393 feet, receives the information, the data is transferred via a hardwired cable connection to the system controller. Multiple antennas and system controllers are used on larger systems, explains Kirt Sloan, Product Specialist for Herd Management at Delaval. The data collected in the system controller is lastly sent to the ALPRO herd management software program or DelPro for VMS (Voluntary Milking System) herd management software program from DeLaval. The software program can then generate a range of lists and graphs, depending on the information the producer choose to review. The system is set up so that the tag meters the cow’s activity every 14 seconds and also stores the previous 24 hours of activity in its memory. The tag then sends its entire memory back to the system’s databases on an hourly basis. Sloan states that herein lies a difference between this system and others. “By monitoring a cow’s activity every hour and looking at it in 14-second increments, we get an accurate portrayal of when her activity starts,” he says. Once a tag is placed on a cow, it will take up to five days for the system to learn the cow’s activity and establish a baseline. Systems settings are then set on each individual farm to determine the heat activity parameters of the cows. Included as part of the parameters are cows that show strong heat activity as well as marginal or relative activity. These setting will determine which cows are placed on the high activity lists, Sloan states. The algorithm and software in the management program is the most important point in DeLaval’s activity system, Bågenvik says. She explains that the company cooperated with an agriculture institute in The Netherlands to develop the algorithms used in the system. Additionally, Sloan states that the cow has to be up for three hours in order for her to be recognized in the system as a high-activity cow. This eliminates external factors that could skew the cow’s activity and helps filter out false positives. “It doesn’t matter how good the sensor is if you present too many false alarms to the farmer or present the alarm too late or too early,” Bågenvik says. In order to be able to hold up to the demands of the system, Bågenvik explains that a non-replaceable and non-rechargeable battery was used in the tag. “The development challenge was then to get the battery in the tag to last for 10 years, which is the longest battery life on the market,” she says. The system can be set up in different configurations to meet the needs of the dairy. Sloan explains that the system has the durability of antennas hardwired to the system but also has the capability to send the information from the system controller though a wireless connection. By using this system, producers will be able to detect heats early and time artificial inseminations accordingly. Ultimately, this will help lower reproduction costs on the dairy by reducing days open and services per conception. Sloan explains that producers that do not currently have DeLaval equipment can purchase a stand-alone system with only the activity components they need, including the software, system controller, antennas and the tags. The number of tags to purchase depends on the farmer; however, Sloan suggests that a tag be placed on every animal. TOP RIGHT: The neck-mounted tags used in DeLaval's activity system adapted the technology used in pacemakers in order to be able track a cow's activity. BOTTOM RIGHT: The system's antennas wirelessly capture information from the activity tags every hour and then transfer the information to a system controller via a hardwired cable connection. Photos courtesy of DeLaval.